Anyway, these shots are from an evening I spent patiently waiting on the docks for the sun to go down, and once it did, I was treated to a spectacular show of color! It really is incredible to watch a good sunset from start to finish, because it changes shape and color so rapidly if you blink you might miss it! 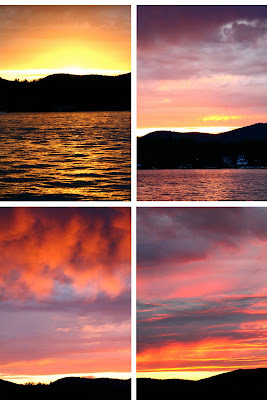 I chose 4 shots from the 4 main color stages the sunset went through. I literally took about 700 pictures this one night, all of the sunset! These are my favorite shots, and the ones that I though really captured the brilliant colors of this particular sunset! Unfortunately, not EVERY sunset here is quite this intense, although it seemed that the stars aligned for me this particular night, they must have know I was waiting around with camera in tow. Omg, these are so, so beautiful! Wonderful photos!! I've always wanted to get a great sunset photo. I came close when I went to Costa Rica, but it was so humid my camera lens looked kind of wet and it didn't work out..ugh! sooo pretty! that is the one thing Los Angeles is missing is pretty sunsets!